First up, we have some eBay listings. According to the seller, this sack of pucks is "great for practicing your shot or stick handling." Habs fans: keep your fingers crossed that Bob G. places a bid offering Mike Ribeiro in return for them. Never mind that eBay will only allow numeric bids. Let Bob work his magic. Here's another bargain. The seller says, "There is some staining..." Ew. How the hell does a second-"hand" cup accumulate seven eight bids??? While we're on the subject of potty humour... Do you suffer from constipation? Hockey's Future can help. On a political note, here are a couple of causes worth fighting for. Something for the geeks: "Hockey pools for profit: A simulation based player selection strategy." It's an interesting read, but it won't dissuade me from my current two-step strategy for hockey pool dominance: intimidation through extensive use of profanity, followed by blatant cheating. 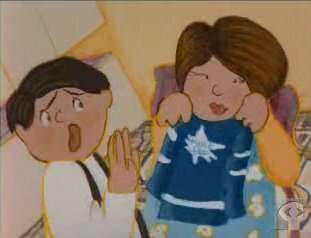 Finally, Sheldon Cohen's short film adaptation of Roch Carrier's "The Hockey Sweater" is now available online at nfb.ca. Wow, 200 posts. What a long, strange trip it's been. Now, I'm afraid Sisu Hockey must go on a brief hiatus (a couple of months at the most) and take a rest from the breakneck pace of posting the last few weeks. There are just too many other things on the go at the moment for me to maintain the quantity and quality of content that my readers have come to expect. Hey! Quit scoffing! posted by Jeff J at 1:39 p.m. Enjoy your time off. Looking forward to reading your insightful posts upon your return. Go Habs (except when they're playing the Sens...)! For the past few months I have been working on my site www.writeonsports.com. It is still in the process of being developed and will be finalized in the next month (or so). The premise of the site is to provide a centralized area where independent people, who like to write on sports or read about sports, are able to find articles/authors they enjoy. As part of my website, I am going to provide a "sportsblog library". This will provide readers a searchable data base to find the sports teams that they enjoy reading about. I would like your site to be part of the sportsblog library. If someone searches for the Canadians they would be able to find a link to your blog. David Croew think's a lot of things. Sad to see you have to stop posting for a while, but glad to see that you are still alive. Hey Jeff - drop me an email at mc79hockey@gmail.com. I want your input on something. drop by sometime! and keep on, keeping on! Good luck on your Habs blog! !